WARNING: THIS PIECE CONTAINS ACERBIC GENERALISATIONS, AND AN OVERALL FEMINIST BATTLE-AXE APPROACH. You are a problem. Well perhaps you are not in and of yourself a problem, but a symptom of a pernicious aspect of our culture – one in which an idea of masculinity validates macho aggression, demeaning advances, and humiliation. But first let me explain what I mean, and why I’m annoyed at you, specifically. I was sitting watching Steve Jobs this Friday (which it must be said I enjoyed and found aesthetically, technically, and culturally sharp. Both insightful and cerebral – starkly well made). Throughout this film – which charts the difficult, inspired, and gladiatorial successes (and failures) of Apple’s titular leader/dictator/tragic hero – there were moments in the narrative that focused on Jobs’ relationship with his ex partner Chrisann Brennan, and his apparent daughter Lisa. These scenes humanised Jobs, highlighting his difficult, horrid, and selfish attributes. When, for example, Chrisann confronts Steve in regards to herself and her daughter Lisa living on welfare, Jobs (who at this point denies his paternity) seems willing to help, albeit from a totally cold, uninvolved place. Okay I get that; this is the man he is. I can accept this, dramatically and personally. I’m not criticising Jobs’ character in this moment; the film may take liberties with history, and it’s true nobody can understand the full extent of the truth(s) behind their relationship. What I will criticise, however, is the fact that you men, sitting rows behind me but wafting chuckles to my neck, find humour in Jobs’ insistent and persistent degradation and humiliation of Chrisann’s concerns for both herself and her daughter’s wellbeing. There were moments in the film in which the pair argue over money (and of course Jobs’ paternity), in which Jobs makes accusations regarding Chrisann’s sexual habits and proclivities, and you, in the audience laughed heartily and shamefully at this. You seemed to take pleasure from watching this character be humiliated by masculine power. When Jobs suggests, through his self-imposed algorithm, that Lisa’s father could potentially be 28% of the American male body, you laughed and revelled in the inherent shame and ridicule splashed upon her. It was funny to you. And that makes me sad, and it makes me mad. Katherine Waterson and Perla Haney-Jardine as Chrisann Brennan and Lisa Brennan-Jobs. I don’t think you’re bad men. You might say you ‘love women’, you find them ‘hot’ and ‘fit’ (I’m generalising, can you tell?). This may be the case, but you also, judging by your sustained laugher at moments of Chrisann’s ridicule and belittlement, find female agency threatening and comic. To laugh at Chrisann’s concerns and Jobs’ subsequent belittlement is to show how weak your construction of masculinity is. I can just picture you (from my feminist mantle) watching The Wolf of Wall Street right now, adoring Dicaprio, getting hard at the titillation and recklessness of his character’s lifestyle. Much like this film, Steve Jobsframes its romantic female counterpart in a disparaging light, which makes it all too easy to delegitimise her concerns and scoff at her discourse. Where you may snicker in seeming adoration at Dicaprio’s Jordan Belfort, you laugh at Jobs’ positioning of Chrisann in his world order. This is a problem. It’s gross, arrogant, and embarrassing. Laughing in support of this masculine posturing, this passive aggressive, ‘cool’ and aloof approach, is a problem. Instead of ranking yourself with the male protagonist, try something different – try empathy. It wont make you less of a man, trust me. 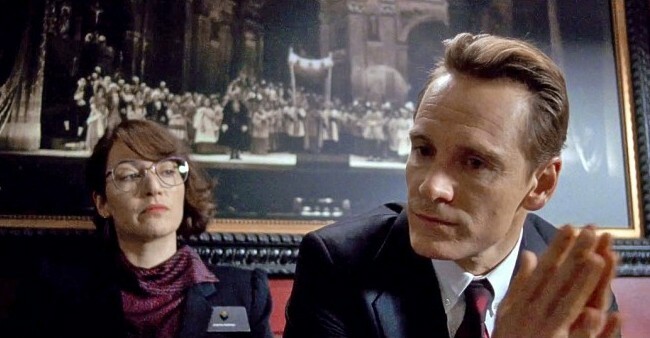 Michael Fassbender and Kate Winslet as Steve Jobs and his assistant Joanna Hoffman. Chrisann deserves better, not necessarily from the film, but from you, the laughing spectators. In these moments Chrisann represents so many women, cinematic and real, who are delegitimised and ridiculed through male arrogance and self appointed authority. Through Steve Jobs’ ostensible God complex it is easy to scoff at his attitude to Chrisann, seeing it as an effect of his illustrious sensibilities. But it also casts a light on the all too prevalent – almost animal – need to delegitimise and hollow out female agency, authority and determination. It’s easy to say this isn’t the case: “you were just laughing”. But when you ‘just laugh,’ you silence Chrisann, and you silence Lisa, you silence many women, and ultimately you silence yourself; muzzling your own potential to be egalitarian, open, and encouraging of full and mutual respect. This is just a small moment in a small film, and indeed you were a small fraction of the audience, but it means something. To have you laugh not at jokes, but at a human in distress, scoffing at her battle for agency and determination, for truth and resect, is a problem. You can say I’m blowing it out of proportion, and you probably will. You’ll laugh in my face as you would do to Chrisann, but soon enough that laugh will fade, calcified by your own waning vestiges of masculinity, and maybe – just maybe – you’ll do more, and be more. More than a laughing monkey in the flawed apparatus of masculine self-preservation. 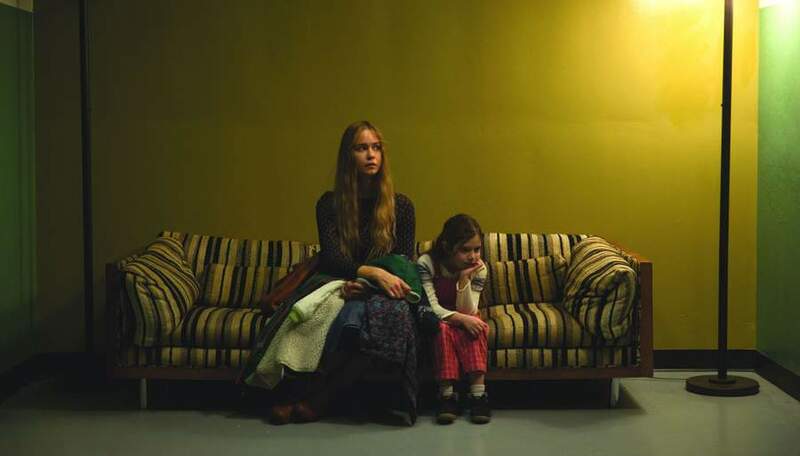 An incensed – but hopeful – feminist viewer. Daniel Massie is a graduate film student. He loves film, TV, actresses, and talking. Right now he wishes he was at a dinner party with Julianne Moore, Meryl Streep, and Tilda Swinton. I read this article and found it very interesting, thought it might be something for you. The article is called An Open Letter to the Men Laughing Repeatedly During ‘Steve Jobs’ and is located at http://prancingthroughlife.com/2015/12/03/an-open-letter-to-the-men-laughing-repeatedly-during-steve-jobs/.